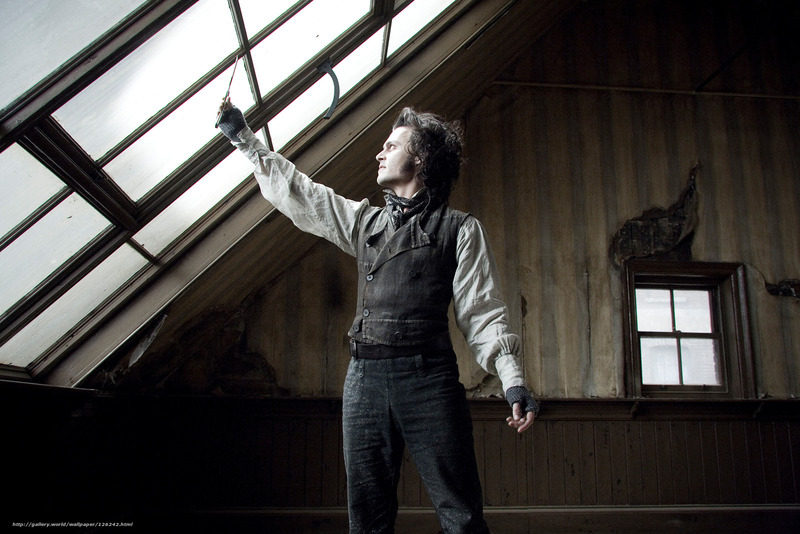 Tim Burton’s 2007 cinematic take on Sondheim’s Sweeney Todd: The Demon Barber of Fleet Street has a star-studded cast that includes Captain Jack Sparrow, Severus Snape, Bellatrix Lestrange, Peter Pettigrew, and Gellert Grindelwald. (I think you know what I mean.) 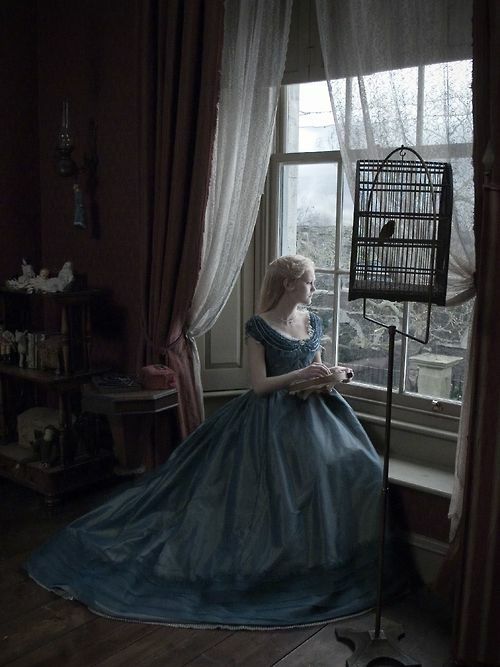 The film’s costumes, designed by Oscar winner and frequent Tim Burton collaborator Colleen Atwood, feature a dark, dreary palette (making the blood stand out that much more) and a very stylized take on Victorian clothing. Love movie musicals? 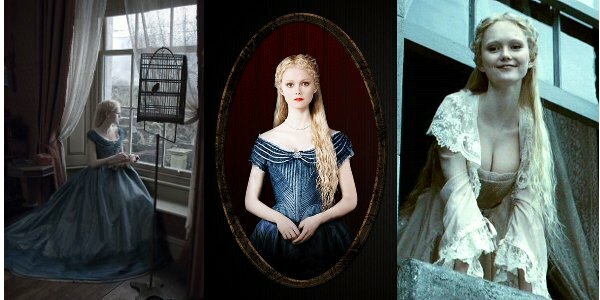 Check out previous CF articles on Les Miserables fashion, Chicago fashion, and Rent fashion. The story of this vengeful barber and his pie-baking partner has been around in varied incarnations since 1846, when the bloody tale of Sweeney Todd became a standard subject for Victorian melodramas. Stephen Sondheim’s musical production, Sweeney Todd: The Demon Barber of Fleet Street, opened on Broadway in 1979 and won 8 Tony Awards, including Best Musical. Len Cariou and Angela Lansbury originated the roles of Sweeney Todd and Mrs. Lovett. The tale begins when Benjamin Barker, an innocent barber, is sent to an Australian penal colony because the evil Judge Turpin lusts after his wife Lucy and wants to get Barker out of the way. Fifteen years later, Barker returns to London, a hardened and bitter man who now calls himself Sweeney Todd. His former neighbor, pie shop proprietress Mrs. Lovett, informs him that his wife poisoned herself after his disappearance and laments the high cost of meat for pie-making. 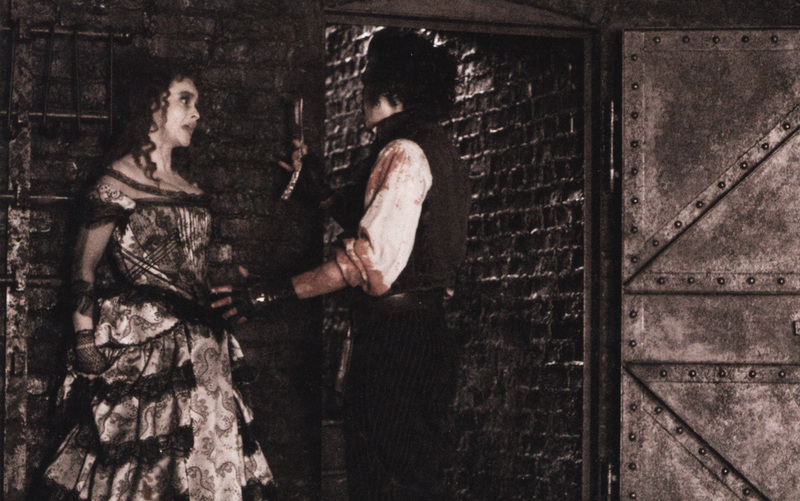 After Sweeney kills a former rival, Mrs. Lovett suggests that they dispose of the body by utilizing it in her pies. Between Sweeney’s tendency to murder his clients after giving them a shave and the immense popularity of the new meat pies, the shop quickly becomes extremely successful. However, Sweeney’s quest for vengeance against the judge turns into a vendetta against all humanity. What happened then, well that’s the play, and he wouldn’t want me to give it away. So if you haven’t yet, watch Sweeney Todd: The Demon Barber of Fleet Street! 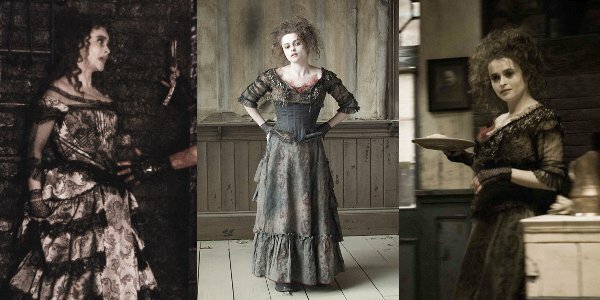 Mrs. Lovett, played by Helena Bonham Carter, is a charismatic but morally deficient baker who admits that her shop sells “the worst pies in London.” Although she has no qualms about chopping people up and feeding them to customers, she also has a soft side: she harbors a deep affection for Sweeney/Benjamin as well as for the orphan Tobias Ragg, whom she has informally adopted. Mrs. Lovett wears fingerless lace gloves and floor-sweeping gowns covered with both ruffles and grime. Snag her creepy-chic style with a draped-hem dress and an opulent brocade jacket. Add wine-colored tights for a splash of blood — I mean, color — then slip your stockinged feet into a pair of Victorian-inspired heels. Accessorize with a feline ring (I’m telling you, those pussycats is quick!) and grab a handy-dandy journal, perfect for jotting down your favorite pie recipes. 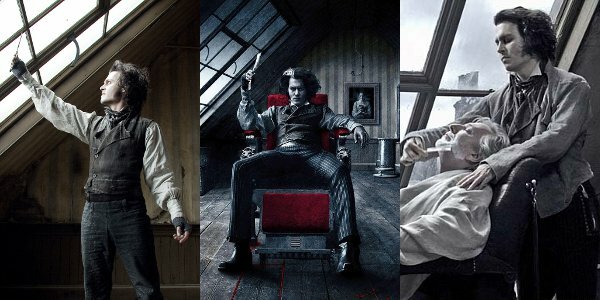 Sweeney Todd/Benjamin Barker, played by Johnny Depp, is the brooding antihero who seeks to wreak some bloody vengeance on Judge Turpin, played by Alan Rickman. After fifteen years of wrongful imprisonment, he has become a grim, spectre-like figure with a shock of white running through his hair. His desire for revenge eventually consumes him, sending him into madness. If you’ve ever wanted to look like a mentally unhinged barber, here’s your chance! Start with a trusty combination of a white blouse and black trousers, then toughen up the look with a motorcycle vest and sturdy boots. 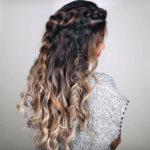 Add a gash of crimson here and there with a wine-colored scarf wrapped around your throat and a classic red lip. Finally, finish off the look with a bangle shaped like a razor: At last! Your arm is complete again! 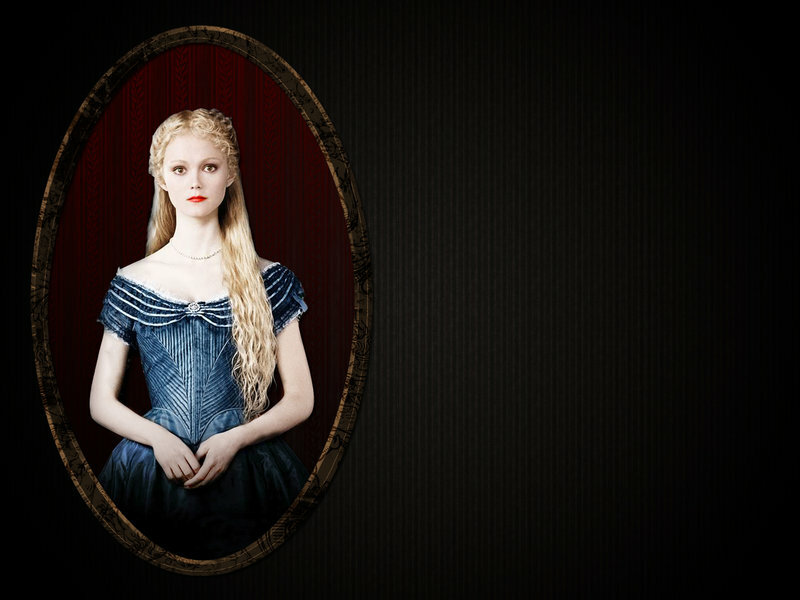 Johanna, played by Jayne Wisener, is the daughter of Benjamin and Lucy Barker. After her mother poisoned herself, she was adopted by Judge Turpin, who has now turned his lecherous eye towards his beautiful young ward. However, Johanna falls in love with the young sailor Anthony, played by Jamie Campbell Bower (Jace Wayland! ), who swears to steal her away so they can be together. It must be noted, though, that “Johanna” is one of the creepiest, most stalker-ish songs ever. Johanna’s fashion sense matches her sweet and innocent nature: she typically wears luminous silks and frothy pastels, with her golden hair loose around her shoulders. Luckily, her feminine charm isn’t hard to emulate. Start with a flirty yet polished frock with a sweet fit-and-flare silhouette and a bold cobalt hue. Next, slip on a soft angora cardigan in a pretty blush tone that recalls Johanna’s dressing gown. While Johanna’s red lipstick is striking against her stark white makeup, natural-looking flushed cheeks are a much easier look to achieve for everyday. A delicate avian charm necklace refers to Johanna’s song “Green Finch and Linnet Bird,” in which she expresses her desire for freedom. If you want to add a trendy twist to the outfit, try out a pair of metallic oxfords. But if you’re a girly-girl through and through, go for it with a pair of bejeweled ballet flats. I remember being so excited by this sequence when I first saw the film because “By the Sea” is one of my favorite songs from the musical. 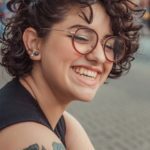 After the runaway success of her new and improved pie shop, Mrs. Lovett excitedly tells a distracted Sweeney about her plans for a future together. 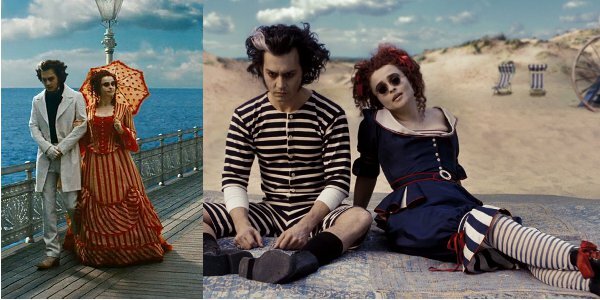 The garishly colorful scenes are a fun break from all the dark and gory depictions of London, and the bold costumes prove that all Tim Burton movies require that someone at some point be wearing a ridiculous amount of stripes. 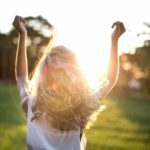 While it’s not quite beach weather right now, it’s never too early to start planning for summer. 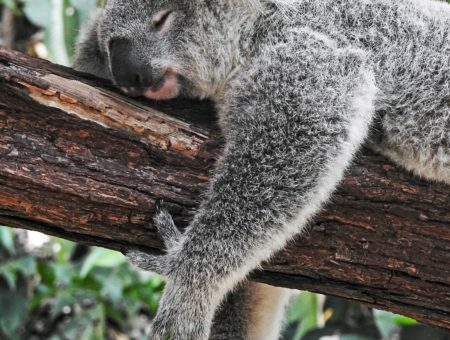 (Or perhaps you’re planning a seaside jaunt before then!) Although you’re probably not keen on wearing authentic Victorian swimming bloomers, a vintage-inspired beach outfit is fun and classy. Plus it’ll make you stand out in a sea of itsy-bitsy bikinis! Pair a super-glam ruched swimsuit with a pair of scalloped high-waisted shorts for a retro look (plus, since it’s a one-piece, you could totally pass it off as a top). Then slip on a pair of red sandals for a pop of color. 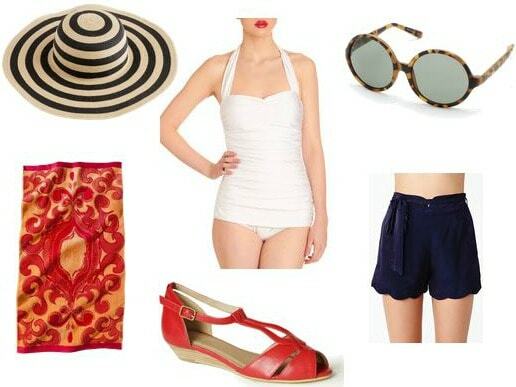 A dramatic straw hat, circular sunglasses, and an ornate beach towel resemble Mrs. Lovett’s fantasy outfits. Get ready to turn heads while you’re down by the beautiful sea!